The neonatal intensive care unit ( NICU ) is a shock. Clayton was born at 34 1/2 weeks. It was a complete surprise. I wasn't allowed to hold him until 24 hours after he was born. Neither of us was healthy. When holding time finally came, the nurse placed his tiny body on my chest. He seemed too tiny even to sing to so I whispered to him softly and gently hummed. His first lullaby in my arms was that one long low note and his tiny hand reached up toward the sound. No matter how your baby begins his earthly life, you can use sound and music to bond with them. Even if your baby is too small to be held, there is healing for them in your voice and they will be thrilled every time they hear you. 1) Humm. Humming does not have to have any kind of a melody. With an infant this is especially effective if you and your baby are skin to skin and heart to heart on your chest. 2) The sound of the heart is an “Ahhhh.” Hold your infant on your chest with your own head to the right so that you are heart to heart. Focus on the love you have for your child and say or sigh “Ahhhhh.” Both humming and “ahhhing” are great during kangaroo care. Doing this with your spouse with both your heads to the right and saying “Ahhhh” at the same time can help sustain you through the hospital experience also. 3) Sing them a lullaby. 4) Sing their name to them softly over and over. 5) Make a simple recording of your own voice to be played to your baby when you are not able or allowed to be with them. Stay positive and put as much love and support in your voice as possible. You could sing a lullaby, or just tell your baby how much you love them and how proud you are of them. 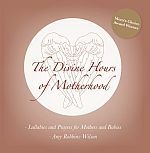 Prayers for the Neonatal ICU can be found in my book Transformational Mothering- A Prayerful Companion for New Mothers.